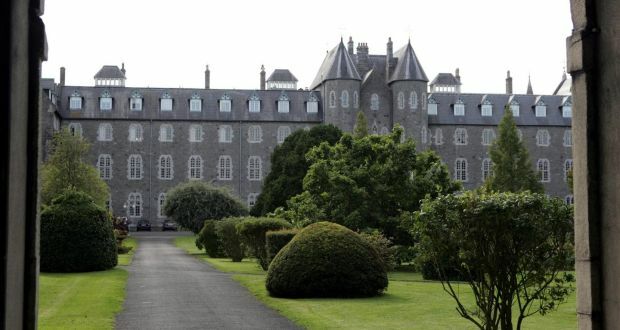 The poisonous thing about Maynooth seminary is that, like all Roman Catholic seminaries, it is a patriarchal, hierarchical institution. Seminaries perpetuate the unjust rule of men over women in the church. They are an integral part of a culture of institutional violence, of spiritual abuse, blind to women’s dignity, spiritual gifts and callings. Seminaries are where the clerical leaders of the church have been formed and where future leaders are trained. They are exclusively male. This is based on the belief that while both women and men are in the image of God, men are more fully so. So they can represent Christ the head, while women can only represent Christ the body. Men can exercise authority in the church, women can only obey. Men decide what limited roles can be given to women. Men know the mind of God, who after all, can only be addressed officially as “He”. Churchmen claim to have divine knowledge as to what God can’t be and do in women and through women. It’s called DMA: Divine Male Authority. It’s more important than our common humanity and the one Baptism, the one Spirit we all share, women and men. The gospels show us quite clearly that Jesus didn’t live, die and rise from the dead to divinise oppressive patriarchal structures. However, the liberating power of his love was too radical, and still is. Life-giving authority quickly got replaced by abusive power. Patriarchy and hierarchy became defining characteristics of the community of disciples, the church, undermining the equality of all the baptised. After centuries of being considered inferior and subordinate to men, women are now considered “equal”, but not so equal that churchmen would forgo their DMA. Women are equal but different. That difference apparently renders women unfit to minister in a myriad of ways. So, only men can have a divine mandate to govern and to teach: no women had a vote at the recent synod on the family. Somebody who knows a lot about the toxicity of “equal, but different and therefore separate” is Patricia Fresen. Fresen was a Dominican sister in South Africa at the time of the apartheid struggle. She fought against it, and broke some of its unjust laws, allowing black children in school with white children. Later, when she taught in a seminary, her eyes were opened to the church’s gender apartheid. While she taught homiletics (preaching) to the male seminarians, she could not preach at their community Mass. Discovering a call to minister, she was ordained: unjust laws sometimes need to be broken before changed. Another woman who was led to break these unjust, oppressive rules was Australian Sr Irene McCormack,who was executed 25 years ago by the Shining Path in a small village in Peru, and is remembered as a martyr. There were no priests left in that village: she was the one who had chosen to stay with the people God had entrusted to her. She was baptising and praying with them, but there was no Eucharist. They came to her and said “give us Eucharist”. She did not want to but her eyes were opened and she wrote: “They freed me to exercise Eucharistic ministry among them . . . It seems to me, therefore, that the preoccupation of our church leaders with power and control over who can celebrate the Eucharist, who can and who can’t receive the Eucharist, is right up the creek. “Not only is it a contradiction to the proclamation of Jesus that there is no distinction between male and female, but it shows a lack of appreciation of the plight of villagers like ours all over the world that our church continues denying its official ministry, that it is by nature communion. In Ireland and throughout the world, communities gather regularly in memory of Jesus and celebrate Eucharist on the fringes of the official clerical church, daring to “obey God, and not men”. The Spirit blows where s/he wills. S/he is not limited by gender, sexual orientation or marital status. As patriarchal hierarchical structures die, new communities and ministries are born, witnesses that, in the risen Christ, there is no longer male and female. We are one.